All of the above. I have to watch it again. "Please don't look at me..."
So true, Pgal. So true. This truly shocked me. Still does. Did anyone notice the hatred on his face when he says "I'm a vampire." ? 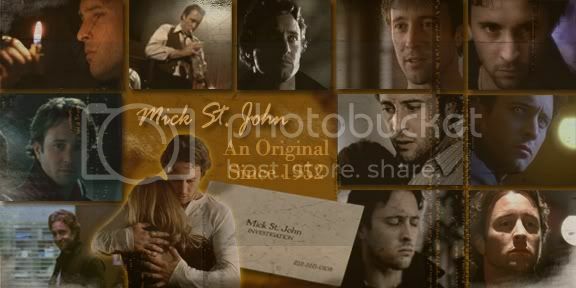 And thus I lost my heart to Mick St. John. Ohhhh, Alle...those fics were SO GOOD. NM, I just rewound that part and watched again. It's there...the revulsion, the hatred of himself , the horror that the one person he never wanted to find out what he is sees him for what he is. I was never so thankful that I gave a show a second chance to impress me...because this episode impressed me. ALEX impressed me. Finding out later how hard he had to fight to prove himself in this role made his acting even more impressive to me. He took a role that could have been SO campy and turned it into something wonderful. Oh, yeah... imagine how AWFUL this show would have been, with a lesser cast! Alle! What are you trying to do, scare us half to death? Once I was done admiring human Mick , I read the words on the opposite page. A google search showed that Lee Jay's book is actually "My Friend Leonard" by James Frey (which was published in 2005). Frey is released from jail. His girlfriend commits suicide after her grandmother dies. Frey borrows $30 000 from a man named Leonard, and then disappears for 18 months. Frey reappears and tells Leonard that he has AIDS. Leonard then overdoses on pain meds and dies. Cheery, huh? This book was originally marketed as a memoir, but Frey later admitted that he had never been in jail. Do you think that whoever chose to use that book in the episode was trying to draw parallels between Lee Jay and Frey? Any thoughts? Marigold wrote: A google search showed that Lee Jay's book is actually "My Friend Leonard" by James Frey (which was published in 2005). I wish I'd seen this back when Marigold posted it! It always fascinated me that they used a page from a real book as a prop (and that there was a naughty cuss word on it, even! ), but I had never bothered to figure out what book it was. James Frey is such a controversial guy--he also wrote A Million Little Pieces, which was originally printed as a memoir (and added to Oprah Winfrey's book club with great fanfare). Later it was revealed that both A Million Little Pieces and My Friend Leonard were works of fiction. Oprah disowned him, and his career as a serious author was pretty much over. I find it really fascinating that they chose that book for the prop. It certainly seems as if someone saw parallels between Lee Jay and Frey, although it was probably someone in the prop department using it as a bit of an inside joke. Maybe one of those crew Easter egg thingies that you read about. Today I watched this episode, so I'll post about it as a follow-on. As I said above, I watched OOTP today. I found that the gaping plot holes and production errors in this episode bugged me a lot more after a long break than they did originally. But the feel of the episode was wonderful, and the ending was as wonderful as I remembered. On a shallow note, I loved the deep, gravelly-velvet quality of Mick's voice throughout the episode, and the little "feeding growls" he was making as he fed on the redheaded freshie made me What really struck me was the beauty of both Mick and Beth, and the gorgeous way they were filmed. They both seemed to glow in this episode. And their hair and clothes were fabulous. (I also noticed that 80's Mick was already partial to Henleys. ) I was surprised that Josef was only in a couple of scenes, because he seemed to permeate the whole episode. And he stole the scenes he was in. I really love those two vamps together. Story-wise, I found this episode to be pretty thin. But the casting was fabulous, and the acting was absolutely stellar. They really turned a so-so script into gold here. Alex, especially, was at the top of his game. He really sold Mick's frustration and confusion at being fooled by Lee Jay, and I loved the little nuanced expressions he used throughout. The eyebrow of disdain was in evidence at the end of Lee Jay's speech at the book party, a great way to show what he thought of that load of hogwash. In fact, there are a bunch of individual scenes in this episode that are among my favorites of the whole show--Mick sitting on the stairs, playing with his lighter and brooding; the "Trust me" scene; his amazing scene in Bobby's apartment; the Red room... "You made the news"; that adorable one-sided grin he gave to Beth when he said, "Wanna navigate?" (What girl could refuse? ); Beth's line about the girl always having to wait in the car. And, of course, the ending was absolutely enthralling. We could feel Mick's pain and shame and self-loathing as he was forced to reveal himself to Beth. And even though I totally knew it was coming, I found myself again amazed at the audacity of the show to do the "big reveal" so soon. I'm so grateful that they did it that way--especially since we got only those precious 16 episodes.